Rapid waning of anti-polysaccharide bactericidal Ab and vaccine effectiveness is observed following infant immunization with the serogroup C meningococcal (MenC) glycoconjugate vaccine. This is despite the demonstrable presence of immunological memory. Persistence of functional Ab, therefore, appears to be the key determinant of MenC conjugate vaccine effectiveness. Ab persistence is thought to depend in the short term on the survival of plasma cells generated during priming and in the longer term on the production of new Ab secreting cells from memory B cells. In this study, we found a strong association between the level of MenC-specific Ab and the frequency of memory B cells measured at 5 mo of age (1 mo after 3-dose primary immunization with MenC conjugate vaccine), and the persistence of functional Ab at one year of age. These findings suggest that these two parameters are good markers of B cell responses to priming and can be used as predictors of long term humoral immunity induced by glycoconjugate vaccines received in early infancy. Neisseria meningitidis is one of the principal causes of bacterial meningitis and septicaemia in children, with a peak incidence at the age of 6–24 mo. In response to an increase in the number of cases of meningococcal disease caused by serogroup C meningococci during the 1990s, serogroup C meningococcal (MenC)3 conjugate vaccine was introduced into the U.K. routine infant immunization schedule in 1999 and was offered to all individuals <19 years in a catch-up campaign (1). MenC conjugate vaccine (MenCV) induces bactericidal capsular polysaccharide-specific Abs, the presence of which correlate with protection against the disease (2). Several different factors are thought to contribute to long term protection after immunization with conjugate vaccines: herd immunity, persistence of anticapsular Abs in serum and immunological memory (3, 4, 5). However, the only validated correlate of protection is the presence of serum bactericidal activity (SBA), measured in an in vitro assay using either rabbit (rSBA) or human SBA complement, with a titer ≥1:8 or 1:4, respectively (2, 6). The introduction of MenCV in the U.K. in 1999 led to a marked decline in the number of cases of serogroup C meningococcal disease. However, a study of the direct effectiveness of the vaccine reported that, although the vaccine was highly effective during the first year after immunization in all age groups, effectiveness could not be demonstrated beyond the first year after immunization among those receiving a 3-dose infant schedule (5). Other studies have reported (7, 8) a rapid drop in bactericidal Ab titer by one year of age after infant immunization despite the persistence of immunological memory, which appears to correspond with this decline in effectiveness. In support of the view that functional Ab is necessary for long term protection, studies of Haemophilus influenzae type b (Hib) and MenC vaccine failures have demonstrated that some children developed Hib or meningococcal infections despite the apparent presence of immunological memory (9, 10). In these studies, anticapsular Ab levels and avidity indices were measured in acute and convalescent serum samples obtained from individuals who had suffered from infection with the encapsulated organism and who had either received prior immunization (vaccine failures) or were unimmunized. Immunological memory in these studies was inferred by the presence of significantly higher Ab levels during convalescence in the previously vaccinated subjects (vaccine failures) than in the unimmunized individuals. Most studies that have examined the kinetics of the Ab response in primed individuals have observed an increase in functional Ab by day 5 after immunization (11, 12). However, a recent study (13) of the Ab response to serogroup C polysaccharide vaccine among children previously primed with only one dose of MenCV at 12–15 mo of age, reported an increase in bactericidal Ab levels within 2–4 days of reimmunization. These observations imply that immunological memory by itself is too slow to provide protection when a primed individual acquires an invasive strain of these encapsulated bacteria; protection afforded by the secondary rise in Ab following exposure to the organism develops only after several days, whereas the meningococcus invades the blood and disease develops within hours. As a result of these observations, the current immunization strategy in the U.K. depends on maintenance of protective Ab levels in the blood through use of a booster dose of both Hib and MenC vaccine in the second year of life (www.advisorybodies. doh.gov.uk/jcvi/childhoodimmunisationoc05.pdf). B cells produce Ab and are, therefore, the principal determinant of long-term protection against encapsulated bacteria after immunization; indeed, it has been shown that memory B cells persist for several years after Ag exposure (14). It is not clear whether memory B cells reside in secondary lymphoid organs (15) in the bone marrow (16) or whether they continuously recirculate between secondary lymphoid organs through the blood (17). It is presumed that these memory B cells maintain protective Ab levels in serum by continuously differentiating into plasma cells. This phenomenon may be Ag-independent and may occur in response to polyclonal stimuli (derived from microbes or activated T cells) (12, 18, 19). Alternatively, generation of plasma cells could be Ag-dependent (via cross-reactive Ags, reexposure to the Ag or persisting Ag) (20, 21). Finally, murine studies have shown that a subgroup of plasma cells generated after immunization are long-lived and persist in bone marrow and contribute to sustaining long term Ab production (22, 23, 24). Understanding the generation and maintenance of Abs by immunization is of central importance in developing methods to enhance long term protection against polysaccharide encapsulated bacteria in the first few years of life. In this study, we describe the persistence of MenC-specific B cells and Abs at one year of age after priming with MenCV (a conjugate vaccine containing MenC polysaccharide chemically conjugated onto CRM 197, a mutant diphtheria toxoid) in early infancy and evaluate the B cell and Ab response to a booster dose of MenCV given at one year of age. Furthermore, we assess the relationship between the postprimary generation of memory B cells and Abs, and humoral immunity around the 12-mo booster dose of vaccine. The MenC polysaccharide-specific B cell and Ab responses were compared with the carrier protein (CRM197) responses. A cohort of 72 children of ≥12 mo of age who had participated in a previous study assessing their B cell response to the C polysaccharide component (MenC) during routine infant immunization with MenCV at 2, 3, and 4 mo of age (study M14P5; Eudract number 2004-004962-33) was approached and invited to participate in this “follow-on” study. A total of 33 of those invited agreed to participate. After informed consent by the parents, participants received a dose of 0.5 ml of meningococcal C conjugate vaccine (MenCV; Menjugate, Novartis Vaccines and Diagnostics), by i.m. injection into the antero-lateral thigh. The 0.5-ml dose contained 10 μg of the polysaccharide and between 12.5 and 25 μg of the conjugate CRM197 (mutant protein derived from diphtheria toxoid) and was adsorbed on aluminum phosphate. At the same time, to boost immunity against Hib as per the routine U.K. schedule (www.advisorybodies.doh.gov.uk/jcvi/childhoodimmunisationoc05.pdf), a dose of Hib conjugate vaccine (Hiberix) was administered concurrently in the opposite anterolateral thigh. A 6-ml blood sample was obtained from each child before immunization and at day 30 after immunization. The 33 children were split into five subgroups for an additional blood sample obtained on either day 2, 4, 6, 8, or 9 after immunization, this allowing investigation of the kinetics of the Ab, plasma cell, and memory B cell response after immunization. The protocol was approved by the Oxfordshire’s Research Ethics Committees (approval no. CO6/Q1604/N41; Eudract no. 2006-000732-28). A serogroup C N. meningitidis bactericidal assay was performed using baby rabbit complement according to standard protocols (25). In brief, two-fold dilutions of heat-inactivated sera were incubated with the C11 strain of group C N.meningitidis and freshly thawed rabbit complement (PelFreez). The last dilution producing a ≥50% reduction in colonies (killing) compared with control wells, containing complement and bacteria, was taken as the end point rSBA titer. The serogroup C N. meningitidis polysaccharide-specific IgG concentration was determined by ELISA following a previously described method (26). In brief, immulon 2 microtiter plates (Thermo Electron Corporation) were coated with 5 μg/ml serogroup C meningococcal polysaccharide (National Institute for Biological Standards and Control (NIBSC), Hertfordshire, England) conjugated to 5 μg/ml methylated human albumin (NIBSC) in sterile PBS. Following blocking, eight twofold dilutions of the reference serum (starting dilution 1/150) (CDC 1999) and test sera (starting dilution 1/25) were made directly in the microtiter plate by well-to-well transfer with a multichannel pipette. The reference serum was assayed in triplicate, and test sera were assayed in duplicate. Additionally an internal quality control (an antimeningococcal adult immune serum) was diluted (1/200, 1/1000, and 1/4000) to yield optical densities approximately on the high, middle, and low portions of the reference curve. After overnight incubation at 4°C, microtiter plates were developed with monoclonal-PAN anti-human Fc-γ peroxidase Ab (diluted in serum/conjugate (S/C) buffer) (Stratech) for 2.5 h at room temperature, followed by the chromogenic substrate tetramethylbenzidine dihydrochloride monohydrate (Sigma-Aldrich), and the reaction was stopped after 30 min with 2 M H2SO4. The OD of each well was then read at 450 nm. The diphtheria toxoid- IgG concentration was determined using a Luminex multiplex assay as previously described (27). The results were read on a Bio-Plex reader (Bio-Rad) and the data acquired by use of a computer software package (Bio-Plex Manager; Bio-Rad). Up to 5 mls heparinized blood was diluted 1/2 with RPMI 1640 medium (Sigma-Aldrich) to which penicillin-streptomycin solution (Sigma-Aldrich) and l-glutamine 200 mM (Sigma-Aldrich) had been added at a dilution of 1/100 (complete medium). The PBMCs were then separated by density gradient centrifugation over Lymphoprep (Axis-Shield; Diagnostics). PBMCs were washed once in complete medium before further preparation for ELISPOT or cell culture. ELISPOT plates (96-well PVDF membrane) (Millipore) were coated with either 5 μg/ml serogroup C meningococcal polysaccharide (NIBSC) conjugated to methylated human albumin (NIBSC), or 10 μg/ml diphtheria toxoid (Statens Serum Institut), or 10 μg/ml goat anti-human Ig (Caltag Laboratories) in sterile PBS. PBS alone was added to the Ag blank wells. The ELISpot plates were stored at 4°C until use. PBMCs prepared from peripheral blood were washed three times in complete medium with 10% FCS (Sigma-Aldrich) and resuspended to a final concentration of 2 × 106 PBMCs/ml. A total of 100 μl/well of the suspension was added to ELISpot plates, previously blocked with complete medium with 10% FCS, and incubated overnight at 37°C in 5% CO2 and 95% humidity. The cells were washed with PBS-Tween 20 and bound IgG Abs detected using a 1/5000 dilution of goat anti-human IgG γ-chain specific alkaline phosphatase conjugate (Calbiochem) in complete medium with 10% FCS, developed using a 5-bromo-4-chloro-3-indolyl phosphate in NBT dissolved in aqueous dimethylformamide (Bio-Rad). PBMCs prepared from peripheral blood were resuspended in complete medium with 10% FCS at a final concentration of 2 × 106 PBMCs/ml and added to 96-well round-bottom culture plates (Fisher) in 100 μl/well. Stimulated medium, containing 1/5000 Staphylococcus aureus (Cowan strain bacteria; SAC) (Calbiochem), 1/6000, or 83 ng/ml Pokeweed mitogen (PWM) (Sigma-Aldrich) and 1/40 or 2.5 μg/ml CpG oligonucleotide (ODN-2006) (Invitrogen). The cells were incubated at 37°C in 5% CO2 for 5.5 days before being re-suspended and washed four times in complete medium with 10% FCS. The cultured cells were plated onto precoated ELISPOT plates at 2 × 105 cells/well and then incubated and developed as for the ex vivo ELISPOT described above. Spots were counted using an AID ELISPOT Reader ELR02 (AID) and ELISPOT software, version 3.2.3 (Cadama Medical). Spot-forming cells were counted and confirmed by visual inspection. Identical settings were used for all plates and Ags and the operator was blinded to which sample was being counted. Ab forming spots were large, spherical in size with “fuzzy” granular edges. Spots that did not fit this description were not counted and considered as in vitro artifact. For the purposes of analysis, ELISPOT assays in which fewer than four spots were detected were treated as though no Ab-secreting cells (ASCs) were detected. The number of replicate wells used depended on the total number of PBMCs available, which varied between individuals and at the different time points. For MenC specific B cell assays where at least four wells of 2 × 105 PBMCs were used the minimum sensitivity of the assay was 5 cells per million PBMCs. For diphtheria toxoid specific B cell assay where at least two wells of 2 × 105 PBMCs were used the minimum sensitivity was 10 cells per million PBMCs. Stata (version 9.1; StataCorp) was used for the statistical analysis. rSBA titer and ELISA IgG concentrations were summarized using geometric means with corresponding 95% confidence intervals. For B cell numbers medians with 5th - 95th percentile were calculated. Within group comparisons of B cell numbers and Ab concentrations at varying time points were made using the Wilcoxon signed ranks test for paired data with the p values adjusted for multiple comparisons using the false discovery rate method (28). The correlation between the different variables was compared using the Spearman’s rank correlation coefficient, using the log transformed rSBA titer and ELISA IgG concentration but untransformed B cell numbers, with the p values adjusted for multiple comparisons using the false discovery rate method (28). Furthermore, we compared children’s ability to produce memory B cells at 5 mo of age with the persisting protective Ab titer at one year of age, using the Fisher’s exact test. Because of the small sample size of this study no multivariate analysis was run. Between May and August 2006, all 33 children completed the study. However, because of insufficient sample volumes or assay failures, not all data points were available for each time point (see number of participants for each result of Table I⇓). At one year of age, 8 mo after three doses of MenCV at 2, 3, and 4 mo of age, the prebooster rSBA geometric mean titer (GMT) had declined significantly from 1526 to 9 (p = 0.0007) and only 9/22 (40.9%) children had an rSBA titer equal or above the putative protective threshold of 1:8 (Table I⇑ and Fig. 1⇓c). MenC specific- IgG (a), bactericidal Ab (c), and diphtheria toxoid specific-IgG (b) responses to immunization with MenCV at one year of age. a, Using an ELISA, MenC-specific IgG response was measured at 5 mo of age after primary immunization and at various days following immunization with MenCV at one year of age. The horizontal bars represent the GMC at each time point. b, Using a Luminex multiplex assay, diphtheria toxoid-specific IgG response was measured at 5 mo of age after primary immunization and at various days following immunization with MenCV at one year of age. The horizontal bars represent the GMC at each time point. c, Serum bactericidal activity using the rabbit complement (rSBA) was measured at 5 mo of age after primary immunization and at various days following immunization with MenCV at one year of age. The horizontal bars on the graph represent the GMT at each time point. By day two, after booster immunization at one year 1/5 children had an rSBA ≥1:8, by day four 5/6 had an rSBA titer ≥1:8 and from day six onwards, all children had protective levels of bactericidal Ab (rSBA GMT ≥1:8). The rSBA GMTs at day 30 postbooster were significantly higher than the rSBA GMTs prebooster (p = 0.001) with an average of 654-fold rise (95% CI: 257-1664) (Table I⇑). The postbooster rSBA GMTs were also significantly higher than the rSBA GMT one month postprimary immunization (p = 0.0003). At one year of age, before the booster dose of MenCV a MenC-specific IgG concentration ≥2 μg/ml was seen in 6/22 children, all of whom had a protective rSBA titer (≥1:8). The prebooster concentrations of MenC-specific IgG and diphtheria toxoid-specific IgG were significantly lower than the GMC after 3-dose primary immunization (p = 0.0008 for MenC and diphtheria toxoid). Following challenge with MenCV, levels of Abs specific for MenC and diphtheria toxoid increased rapidly. At 30 days after immunization at one year of age the IgG concentrations were significantly higher than before the booster dose at 12 mo of age (p = 0.001 for MenC and diphtheria toxoid) with an average fold increase of 26.3 (95% CI: 16.2–42.5) for MenC-IgG and 10.7 (95% CI: 7.2–15.9) for diphtheria toxoid-IgG. Furthermore, 30 days post-MenCV at one year of age, the MenC-IgG concentration was significantly higher than after primary immunization at 5 mo of age (p = 0.02). However, the concentration of diphtheria toxoid-IgG was not significantly higher (p = 0.06) (Table I⇑ and Fig. 1⇑). After primary immunization, the decline in MenC-specific Ab (measured by rSBA titer and MenC-specific IgG concentration) was similar for all children (Fig. 2⇓) from 5 mo (1 mo after priming with 3 doses of MenCV) to 12 mo of age. Following the booster dose of MenCV at one year of age, there was a tendency that the children who had lower Ab levels (measured by rSBA titer and IgG concentration) at 12 mo of age had higher increase in Ab (Fig. 2⇓). Therefore, the rise in Ab was lower in the children who had higher Ab levels prebooster, although the postbooster levels in these children were higher (Fig. 2⇓). Further, the children with a rSBA titer at one year of age <1:8 had an average fold increase of 2353 (n = 10), whereas those with a rSBA ≥1:8 had an average fold increase of 159 (n = 7). 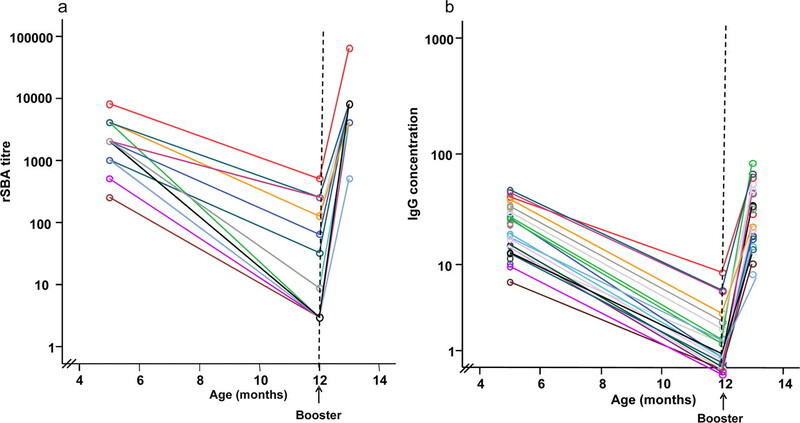 The children with an IgG concentration at one year of age <2 μg/ml had an average of 34.4-fold increase (n = 13), compared with an average fold increase of 10.9 (n = 4) in those with an IgG concentration ≥2 μg/ml. Similar phenomenon were observed for the diphtheria toxoid–IgG responses. Ab decline after primary immunization (from 5 to 12 mo of age) and Ab rise after a booster dose of MenCV at one year of age (from 12 to 13 mo). Results are shown for MenC- rSBA titer (a) and MenC-IgG concentration (b). Each line color represents a different child. Before the booster dose of MenCV at one year of age there were no plasma cells specific for MenC and diphtheria toxoid detected in peripheral blood. The first appearance of MenC- and diphtheria toxoid- specific plasma cells above baseline was seen at day 4 with a peak at day 6 and a rapid decline by day 8–9 (Fig. 3⇓). There were almost no detectable specific plasma cells at day 30 after vaccination. The median frequency of plasma cells specific for MenC and diphtheria toxoid was comparable, but MenC-specific plasma cells decreased more rapidly than diphtheria toxoid-specific plasma cells. In comparison to the response to primary immunization, the peak frequency of plasma cells was higher after the booster dose of MenCV at one year of age (median of 112.5 MenC-plasma cells per million PBMCs and 121.5 diphtheria toxoid-plasma cells per million PBMCs at day 6 following one year booster dose, compared with 50 MenC-specific plasma cells and 83 diphtheria toxoid-specific plasma cells per million PBMCs at day 4 following the third dose of MenCV at 4 mo of age) (data not shown). MenC- and diphtheria toxoid- specific plasma cell responses to immunization with MenCV at one year of age. The children were immunized at day 0 and the frequency of MenC- (a) and diphtheria toxoid (b)-specific ASCs was measured at various days after immunization. The horizontal bars represent the median number of specific ASCs at each time point. The minimum sensitivity of the assay is plotted as a broken line on the graph for each figure. In some assays there were fewer PBMCs available for analysis and the minimum sensitivity was two-fold higher (data not shown on graphs). The zero values have been given the arbitrary value of 1 for illustrative purposes. Before the booster dose of MenCV at one year of age 7/23 (30%) children had ≥5 MenC-memory B cells per million cultured lymphocytes. The median frequency of MenC-memory B cells for the 23 children was 3.5 MenC-memory B cells per million cultured lymphocytes. By contrast, at 5 mo of age after primary immunization 8/22 (36%) children had <5 memory B cells per million cultured lymphocytes. The median frequency of MenC-memory B cells for the 22 children was 11 MenC-memory B cells per million cultured lymphocytes (Table I⇑). The frequency of memory B cells before the one year vaccine dose was significantly lower than the memory B cell frequency reached after primary immunization at 5 mo of age (p = 0.01) (Table I⇑). However, the frequency of memory B cells specific for diphtheria toxoid had not significantly declined at one year of age compared with the frequency at 5 mo (median difference 0, range (−9, 11), p = 0.6; Table I⇑). Following the booster dose of MenCV at one year of age, the first response above baseline was seen by day 8 for MenC- and diphtheria toxoid-specific memory B cells (Fig. 4⇓). 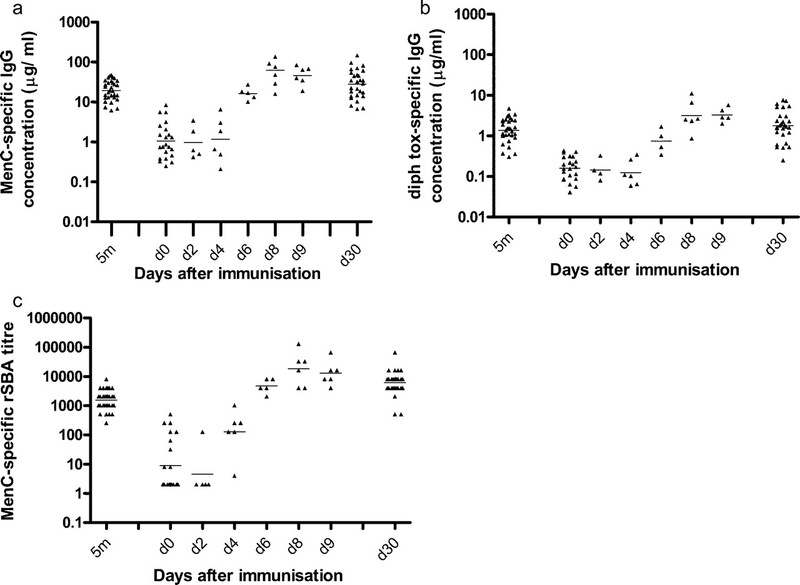 At 30 days after immunization, MenC and diphtheria toxoid-specific memory B cells were still detectable in blood at a significantly higher frequency than before the booster (p = 0.002 for MenC and p = 0.02 for diphtheria toxoid) These frequencies were also significantly higher than those measured 1 mo after primary immunization for diphtheria toxoid (p = 0.009) but not for MenC (p = 0.2). MenC- and diphtheria toxoid-specific memory B cells at 5 mo and after immunization with MenCV at one year of age. Using an ELISPOT assay after 6 days culture with SAC/CpG/PWM, the MenC- (a) and (b)-diphtheria toxoid-specific memory B cell response was measured at 5 mo of age after primary immunization and at various days following immunization with MenCV at one year of age. The horizontal bars on the graph represent the median number of specific ASCs at each time point. The minimum sensitivity of the assay is plotted as a broken line on the graph for each figure. In some assays there were fewer PBMCs available for analysis and the minimum sensitivity was two-fold higher (data not shown on graphs). The zero values have been given the arbitrary value of 1 for illustrative purposes. At 5 mo of age there was a strong evidence of association between the MenC-specific memory B cells and Ab (Table II⇓) but not between the diphtheria toxoid-specific memory B cells and Ab (r = 0.3, p = 0.2). The level of MenC-specific Ab and memory B cells produced after priming correlated with the persistence of Ab and memory B cells at one year of age, and with the postbooster Ab and memory B cell levels (Table II⇑ and Fig. 5⇓). Similarly, diphtheria toxoid memory B cells and Ab measured at 5 mo of age correlated with the persistence of diphtheria toxoid-antibody at one year of age (r = 0.8, p = 0.003 and r = 0.7, p = 0.002). However, only the diphtheria toxoid-antibody measured at 5 mo of age, and not the memory B cells, correlated with the postbooster Ab levels at 13 mo of age (r = 0.6, p = 0.003). Correlations between MenC-memory B cells and Ab at 5 mo of age with the persisting Ab at one year of age and postbooster Ab levels, using the Spearman’s correlation method (see Table II⇑ for the r and p values of each correlation). The presence or absence of detectable MenC specific memory B cells at 5 mo of age (i.e., ≥5 MenC-memory B cells per million cultured lymphocytes) was found to have some evidence of correlation with the maintenance of a “protective” rSBA titer (≥1:8) to 1 year of age (p = 0.03) (Table III⇓). In this study, we observed for the first time that the ability of children to produce MenC-specific memory B cells and Ab at 5 mo of age during primary immunization allows both determination of the strength of the immune response to priming and also prediction of the persistence of functional Ab at one year of age and the intensity of the humoral immune response to a booster dose of MenCV at one year of age. At one year of age, <50% of the study children had maintained protective bactericidal Ab levels. These observations support the previous evidence that protective Ab levels do not persist well in children vaccinated with MenCV under 2 years of age (8, 13, 29). By contrast, immunization of older children and adults results in more persistent protective Ab for some years (5, 11, 30). Previous studies (6, 7, 31) demonstrated that immunological memory was maintained despite the waning of MenC-specific Abs. In this study, following secondary immunization with MenCV at one year of age, MenC-specific Abs increased rapidly and by day 6 all children had achieved a protective rSBA titer. This Ab response to a booster dose of MenCV at one year of age after 3-dose priming in infancy is comparable to the one observed by Tsai et al. (2006) in children primed with a single dose of MenCV at 12–15 mo of age and who were challenged with serogroup C polysaccharide at 24 mo of age (in this study all children had mounted protective bactericidal Ab levels by day 5) (13). However, the maintenance of functional Ab rather than the immunological memory appears to be the key determinant of long term protection against invasive diseases caused by encapsulated bacteria. It is not clear how long term production of Ab is maintained. It has been suggested (32, 33) that long-lived plasma cells surviving in bone marrow niches continue to secrete Ab after the exposure with the Ag. Slifka et al. (23) have demonstrated that these cells could survive for longer than one year in mice. The presence of long-lived plasma cells has not been demonstrated in humans. Alternatively, it was suggested that plasma cells would have to be continuously replaced by the turn over of memory B cells in humans. This phenomenon may be Ag-independent and occur by polyclonal stimulation of B cells (12) by microbial products (which stimulate B cells via toll like receptors), or through bystander T cell help (cytokines secreted by T cells activated by another Ag) (34). Others (21) have postulated that this event is Ag-dependent and occurs through cross-reactive Ag or persisting Ag. It has been shown that although a germinal center persists for only 3 wk following immunization, memory B cells continue to proliferate and to differentiate into plasma cells in the lymphoid tissues for several months after stimulation in response to the Ag persisting on the follicular dendritic cell networks (35). Although these mechanisms are unclear in humans, studies in mice indicate that long-lived plasma cells survive in bone marrow niches independently of memory B cells and of the Ag (36). In the present study, there was a strong correlation between the MenC-specific memory B cells and Abs at 5 mo of age and also between these two parameters and the persistence of Ab at one year of age. These results suggest that priming with MenCV in early infancy may generate germinal centers of various sizes in different children. Thus, some children produce a higher number of memory B cells and plasma cells and are therefore able to produce higher Ab levels after priming. In contrast, the children who generate small germinal centers will have a smaller B cell pool and lower Ab response at 5 mo of age (1 mo after primary immunization). The immune response is determined by a combination of genetic and environmental factors but genetic factors predominantly determine the Ab response to vaccines given in early life (37, 38), whereas environmental factors influence Ab persistence and avidity maturation (38). In this study, the decline of the Ab concentrations from 5 mo (1 mo after primary immunization) to 12 mo was similar in all children. Thus, it is not clear whether B cells have a direct role in sustaining Ab production after priming or whether the level of persisting Ab at one year of age only depends on the biological half life of Ab and would, therefore, mostly be determined by the level of Ab reached after primary immunization. However, it was observed that the anti MenC IgG GMC was 19.7 μg/ml at 5 mo of age (i.e., post primary immunization), whereas at one year it was 1.1 μg/ml. An explanation based solely on Ab half-life (3 wk (39)) is insufficient to account for these high levels. This suggests the existence of other mechanisms determining the long-term persistence of Ab. Persisting Ab at one year of age correlated more strongly with the level of Ab at 5 mo than with the number of memory B cells present at 5 mo. However, when children were separated into those who had detectable and undetectable memory B cells at priming, we found that all those with undetectable memory B cells after priming did not maintain protective Ab levels at one year of age. Conversely, 2/3 of the children with detectable memory B cells at 5 mo had maintained protective rSBA titer at one year. All children produced high levels of Ab at 5 mo of age (IgG between 6.2 and 47.6 μg/ml and rSBA titer between 512 and 8192); therefore, it is more difficult to define a cut-off of Ab level after priming to predict long term protection. Therefore, even if the role of memory B cells in the long term maintenance of protective Ab levels is unclear, it appears that the measure of memory B cells, rather than the Ab at 5 mo of age can better discriminate the children who will sustain protective levels of Ab. The role of B cells generated after priming in the secondary immune response has not been studied previously. In this study, we observed that the children who achieved the highest Ab level following priming also attain the highest Ab level following the booster dose of MenCV. However, there was a difference in the rise of the Ab response: the children with the lower prebooster Ab level at 12 mo of age had the higher increase in Ab compared with the children with higher level at baseline. Similar results have been observed following other vaccines (40, 41). These findings suggest that there might be a mechanism of feedback above a certain Ab level and Ag-specific B cells might not increase above a certain threshold. Similarly, it has been shown that a third dose of MenCV did not induce a higher Ab titer compared with the second dose (42). It is not clear how this feedback mechanism operates; it could result from competition between the pre-existing Ab and the membrane-bound B cell receptors for the Ag, impairing the activation of B cells (17). We used the ex vivo ELISPOT assay to detect cells that spontaneously secrete Ab after PBMCs separation. Clutterbuck et al. (43) have shown that these cells have the phenotype of plasma cells (CD20+CD38+CD27+ or CD20−CD38+CD27+). In this study, following immunization with MenCV at one year of age, the first appearance of MenC- and diphtheria toxoid- specific plasma cells above baseline was seen at day 4 with a peak at day 6, followed by a rapid decline in the frequency to day 8–9. These plasma cell kinetics are similar to those observed in previous studies with a variety of vaccine Ags in primed adults: MenC polysaccharide vaccine and MenCV (30); varied serotypes of the heptavalent pneumococcal conjugate vaccine and diphtheria toxoid (43) and tetanus toxoid (12), suggesting that the kinetics of the secondary plasma cell response is common to all Ags (T-dependent and T-independent) and all age groups. Given the rapidity of the plasma cell response following immunization in previously primed individuals, these cells are likely to represent plasma cells derived from pre-existing memory B cells. It was shown in humans that memory B cells respond to Ag re-challenge 20–30 h earlier than naive B cells, because of their lower activation requirements (44) and their homing to unique Ag-draining sites (e.g., mucosal epithelium) (45). Additionally, it was observed in mice that most memory B cells give rise to extra-germinal center plasma cells upon rechallenge with the Ag (46, 47). It is also possible that, some of these plasma cells are long-lived plasma cells, translocated from their bone marrow niches by an unknown signal after re-exposure with the Ag or that the transient appearance of the plasma cells in peripheral blood represents their passage from their site of production to their long term residence in bone marrow (30). The fate of the plasma cells produced in this day 6/7 burst is unknown. The rise in MenC-antibody was also observed from day 4–6 with a peak by day 8, suggesting that the rapid increase in Ab levels following immunization is produced by these newly formed plasma cells. A previous larger study (30) found a weak correlation between the increase in Ab level and the peak plasma cell response following immunization with polysaccharide conjugate vaccines. As mentioned earlier, this could be explained by negative feedback in Ab production among those with pre-existing raised Ab levels. Furthermore, in this study there was a moderate correlation between the memory B cells at 5 mo and the postbooster Ab levels. These findings suggest that the rise in Ab from day 0 to day 30 postbooster may have various different origins (e.g., persisting memory B cells and long-life plasma cells, newly formed plasma cells and memory B cells) and depend on several factors (e.g., Th cell, APCs, serum titer of specific antibody). Polyclonal stimulation with SAC, CpG-DNA, and PWM for 6 days induces polyclonal proliferation of IgG+ memory B cells and their differentiation into ASC (48). Further, naive B cells are not activated in the absence of specific Ag (they require B cell receptors triggering by anti-Ig) (12) and pre-existing plasma cells do not survive more than few days without appropriate stromal cells support (49). It is therefore likely that the cells detected in this study after culture are derived from B cells that have a memory phenotype. It has been suggested that after their production memory B cells continuously recirculate through the blood and secondary lymphoid organs (17, 50) and it was therefore postulated that the memory B cells found in the circulation were representative for the entire B cell pool (17). Previous studies (14, 17) with diphtheria toxoid, tetanus toxoid, and smallpox specific memory B cells have shown their persistence for a prolonged period after immunization, with a frequency in human peripheral blood of 0.01–1% of total IgG-memory B cells. Similarly, in this study we found that 0.02% of total IgG memory B cells were MenC specific (median frequency) and 0.12% were diphtheria specific (median frequency) by one year of age (8 mo after the 3-dose priming schedule). The frequency of persisting MenC-memory B cells was significantly lower than that reached 1 mo after primary immunization. However, the frequency of diphtheria toxoid-memory B cells was maintained. The factors influencing the maintenance of memory B cells in the circulation after vaccine exposure could be cellular competition (making space for new memory B cells) in secondary lymphoid organs (14), or the persistence of the Ag in follicular dendritic cell (51). We found in this study that following immunization at one year of age, MenC- and diphtheria toxoid-specific memory B cells were detected by the end of the first week after immunization and were still raised above baseline levels at one month (for MenC: 0.26% of total IgG memory B cells; for diphtheria toxoid 0.67% of total IgG memory B cells). The frequency of MenC-polysaccharide-specific memory B cells is one of the lowest values described, though most previous studies have involved adult volunteers. Furthermore, following the booster dose of MenCV at one year of age the MenC-memory B cell frequency was not significantly higher than the frequency reached after primary immunization (at 5 mo of age). This contrasts to diphtheria toxoid-memory B cells which had reached a higher frequency after the booster dose of MenCV than after primary immunization. 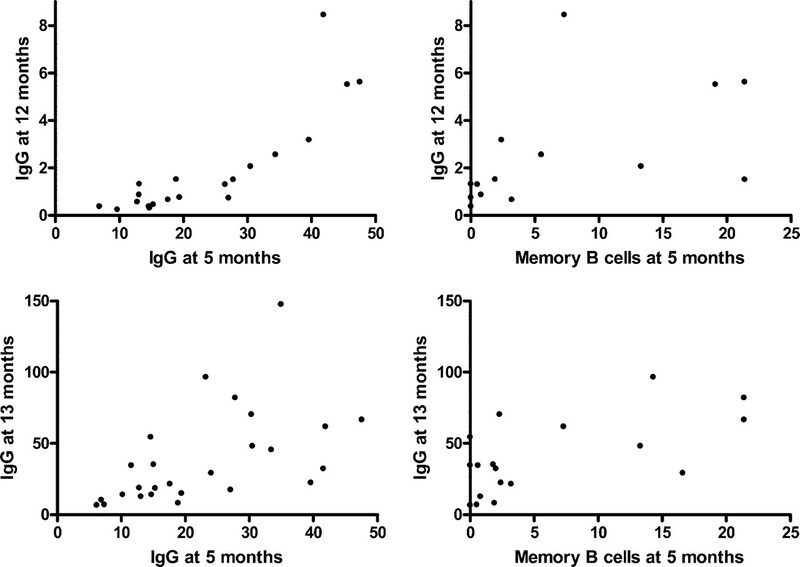 These findings suggest that memory B cells specific for protein Ags better persist in peripheral blood than polysaccharide specific- memory B cells in children. It is possible that polysaccharide specific-memory B cells reside in secondary lymphoid organs because of the retention of polysaccharide Ags as immune complexes in follicular dendritic cells. Additionally, different factors might control the pool size of mature B cells specific for protein Ags and for polysaccharide Ags. It is possible that rechallenge with the polysaccharide only induces the exit of the MenC-memory B cells from their niches and their maturation rather than their proliferation. The memory B cell kinetics we have observed are comparable to those described in previous studies using a variety of vaccine Ags in primed adults (14, 17, 28, 38) and suggest that although MenC-specific memory B cells were only detectable at a low frequency in most children at one year of age, these cells probably persist after priming in secondary lymphoid organs, ready to rapidly proliferate and differentiate upon rechallenge. Therefore, it is possible that the MenC-memory B cells appearing rapidly in the peripheral blood after immunization are recirculating memory B cells, which at steady state reside in peripheral lymphoid organs (mostly in mucosal surfaces) (15, 45), or possibly in the bone marrow (18) and are activated to re-circulate by the presence of Ag in periphery (52). In summary, this study found that the infants who generate a large germinal center (identified by high Ab and memory B cells level) at 5 mo of age (1 mo after primary immunization), best maintained protective Ab levels at one year of age. However, one third of the infants in this study produced a very low number of memory B cells after the initial immunization (<5 memory B cells per million cultured lymphocytes) and did not maintain protective Ab levels by one year of age. An understanding of the factors that determine the production of adequate germinal centers during priming in early infancy could lead to an improvement in the short and longer-term protection induced by glycoconjugate vaccines that are so important for the protection of young children against serious diseases caused by polysaccharide encapsulated bacteria. We thank all the children who participated in the study, and the research nurses and research doctors of Oxford Vaccine Group (University of Oxford, Oxford, U.K.) who undertook the clinical procedures. Elizabeth Clutterbuck and Elizabeth Kibwana assisted with the development of the ELISPOT and ELISA. A.J.P. has conducted clinical trials on behalf of Oxford University, sponsored by Wyeth Vaccines, GlaxoSmithKline Vaccines, Sanofi Pasteur, Sanofi Pasteur MSD, and Novartis Vaccines and has received assistance from vaccine manufacturers to attend scientific meetings. Industry-sourced honoraria for lecturing or writing are paid directly to an independent charity or an educational/administrative fund held by the Department of Paediatrics, University of Oxford. M.D.S. has received assistance to attend scientific meetings from Wyeth Vaccines and Novartis Vaccines and has had travel and accommodation expenses paid by Novartis Vaccines while working in collaboration with Novartis Vaccines in Siena, Italy. A.B. and R.C. are employers of Novartis Vaccines. ↵1 This work was supported by Novartis Vaccines. A.J.P. is a Jenner Institute Investigator. ↵3 Abbreviations used in this paper: MenC, serogroup C meningococcal; MenCV, MenC conjugate vaccine; SBA, serum bactericidal activity; Hib, Haemophilus influenzae type b; PWM, Pokeweed mitogen; SAC, Staphylococcus aureus Cowan bacteria; ASC, Ab-secreting cells. Miller, E., D. Salisbury, M. Ramsay. 2001. Planning, registration, and implementation of an immunisation campaign against meningococcal serogroup C disease in the U.K.: a success story. Vaccine 20: (Suppl. 1):S58-S67. Borrow, R., N. Andrews, D. Goldblatt, E. Miller. 2001. Serological basis for use of meningococcal serogroup C conjugate vaccines in the United Kingdom: reevaluation of correlates of protection. Infect. Immun. 69: 1568-1573. Maiden, M. C., J. M. Stuart. 2002. Carriage of serogroup C meningococci 1 year after meningococcal C conjugate polysaccharide vaccination. Lancet 359: 1829-1831. Ramsay, M. E., N. J. Andrews, C. L. Trotter, E. B. Kaczmarski, E. Miller. 2003. Herd immunity from meningococcal serogroup C conjugate vaccination in England: database analysis. BMJ 326: 365-366. Trotter, C. L., N. J. Andrews, E. B. Kaczmarski, E. Miller, M. E. Ramsay. 2004. Effectiveness of meningococcal serogroup C conjugate vaccine 4 years after introduction. Lancet 364: 365-367. Andrews, N., R. Borrow, E. Miller. 2003. Validation of serological correlate of protection for meningococcal C conjugate vaccine by using efficacy estimates from postlicensure surveillance in England. Clin. Diagn. Lab. Immunol. 10: 780-786. MacLennan, J. M., F. Shackley, P. T. Heath, J. J. Deeks, C. Flamank, M. Herbert, H. Griffiths, E. Hatzmann, C. Goilav, E. R. Moxon. 2000. Safety, immunogenicity, and induction of immunologic memory by a serogroup C meningococcal conjugate vaccine in infants: a randomized controlled trial. J. Am. Med. Assoc. 283: 2795-2801. Snape, M. D., D. F. Kelly, B. Green, E. R. Moxon, R. Borrow, A. J. Pollard. 2005. Lack of serum bactericidal activity in preschool children two years after a single dose of serogroup C meningococcal polysaccharide-protein conjugate vaccine. Pediatr. Infect. Dis. J. 24: 128-131. Auckland, C., S. Gray, R. Borrow, N. Andrews, D. Goldblatt, M. Ramsay, E. Miller. 2006. Clinical and immunologic risk factors for meningococcal C conjugate vaccine failure in the United Kingdom. J. Infect. Dis. 194: 1745-1752. McVernon, J., P. D. Johnson, A. J. Pollard, M. P. Slack, E. R. Moxon. 2003. Immunologic memory in Haemophilus influenzae type b conjugate vaccine failure. Arch. Dis. Child. 88: 379-383. Snape, M. D., D. F. Kelly, P. Salt, S. Green, C. Snowden, L. Diggle, A. Borkowski, L. M. Yu, E. R. Moxon, A. J. Pollard. 2006. Serogroup C meningococcal glycoconjugate vaccine in adolescents: persistence of bactericidal antibodies and kinetics of the immune response to a booster vaccine more than 3 years after immunization. Clin. Infect. Dis. 43: 1387-1394. Bernasconi, N. L., E. Traggiai, A. Lanzavecchia. 2002. Maintenance of serological memory by polyclonal activation of human memory B cells. Science 298: 2199-2202. Tsai, T. F., R. Borrow, H. E. Gnehm, B. Vaudaux, U. Heininger, D. Desgrandchamps, C. Aebi, P. Balmer, R. D. Pedersen, B. Fritzell, C. A. Siegrist. 2006. Early appearance of bactericidal antibodies after polysaccharide challenge of toddlers primed with a group C meningococcal conjugate vaccine: what is its role in the maintenance of protection?. Clin. Vaccine Immunol. 13: 854-861. Crotty, S., P. Felgner, H. Davies, J. Glidewell, L. Villarreal, R. Ahmed. 2003. Cutting edge: long term B cell memory in humans after smallpox vaccination. J. Immunol. 171: 4969-4973. Maruyama, M., K. P. Lam, K. Rajewsky. 2000. Memory B-cell persistence is independent of persisting immunizing antigen. Nature 407: 636-642. Osmond, D. G.. 1986. Population dynamics of bone marrow B lymphocytes. Immunol. Rev. 93: 103-124. Nanan, R., D. Heinrich, M. Frosch, H. W. Kreth. 2001. Acute and long term effects of booster immunisation on frequencies of antigen-specific memory B-lymphocytes. Vaccine 20: 498-504. Sprent, J., D. F. Tough. 1994. Lymphocyte life-span and memory. Science 265: 1395-1400. Schittek, B., K. Rajewsky. 1990. Maintenance of B-cell memory by long-lived cells generated from proliferating precursors. Nature 346: 749-751. Ochsenbein, A. F., D. D. Pinschewer, S. Sierro, E. Horvath, H. Hengartner, R. M. Zinkernagel. 2000. Protective long term antibody memory by antigen-driven and T help-dependent differentiation of long-lived memory B cells to short-lived plasma cells independent of secondary lymphoid organs. Proc. Natl. Acad. Sci. USA 97: 13263-13268. Manz, R. A., A. Thiel, A. Radbruch. 1997. Lifetime of plasma cells in the bone marrow. Nature 388: 133-134. Slifka, M. K., R. Antia, J. K. Whitmire, R. Ahmed. 1998. Humoral immunity due to long-lived plasma cells. Immunity 8: 363-372. Slifka, M. K., M. Matloubian, R. Ahmed. 1995. Bone marrow is a major site of long term antibody production after acute viral infection. J. Virol. 69: 1895-1902. Maslanka, S. E., L. L. Gheesling, D. E. Libutti, K. B. Donaldson, H. S. Harakeh, J. K. Dykes, F. F. Arhin, S. J. Devi, C. E. Frasch, J. C. Huang, et al 1997. Standardization and a multilaboratory comparison of Neisseria meningitidis serogroup A and C serum bactericidal assays: The Multilaboratory Study Group. Clin. Diagn. Lab. Immunol. 4: 156-167. Gheesling, L. L., G. M. Carlone, L. B. Pais, P. F. Holder, S. E. Maslanka, B. D. Plikaytis, M. Achtman, P. Densen, C. E. Frasch, H. Kayhty, et al 1994. Multicenter comparison of Neisseria meningitidis serogroup C anti-capsular polysaccharide antibody levels measured by a standardized enzyme-linked immunosorbent assay. J. Clin. Microbiol. 32: 1475-1482. Pickering, J. W., T. B. Martins, M. C. Schroder, H. R. Hill. 2002. Comparison of a multiplex flow cytometric assay with enzyme-linked immunosorbent assay for auantitation of antibodies to tetanus, diphtheria, and Haemophilus influenzae Type b. Clin. Diagn. Lab. Immunol. 9: 872-876. Benjamini, Y., D. Drai, G. Elmer, N. Kafkafi, I. Golani. 2001. Controlling the false discovery rate in behavior genetics research. Behav. Brain Res. 125: 279-284. Rennels, M. B., K. M. Edwards, H. L. Keyserling, K. Reisinger, M. M. Blatter, S. A. Quataert, D. V. Madore, I. Chang, F. J. Malinoski, J. G. Hackell, P. R. Paradiso. 2001. Safety and immunogenicity of four doses of Neisseria meningitidis group C vaccine conjugated to CRM197 in United States infants. Pediatr. Infect. Dis. J. 20: 153-159. Kelly, D. F., M. Snape, E. C. Clutterbuck, S. Green, C. Snowden, L. Diggle, L. M. Yu, A. Borkowski, E. R. Moxon, A. J. Pollard. 2006. CRM197-conjugated serogroup C meningococcal capsular polysaccharide, but not the native polysaccharide, induces persistent antigen specific memory B cells. Blood 108: 2642-2647. Borrow, R., D. Goldblatt, N. Andrews, J. Southern, L. Ashton, S. Deane, R. Morris, K. Cartwright, E. Miller. 2002. Antibody persistence and immunological memory at age 4 years after meningococcal group C conjugate vaccination in children in the United Kingdom. J. Infect. Dis. 186: 1353-1357. Moser, K., K. Tokoyoda, A. Radbruch, I. MacLennan, R. A. Manz. 2006. Stromal niches, plasma cell differentiation, and survival. Curr. Opin. Immunol. 18: 265-270. Odendahl, M., H. Mei, B. F. Hoyer, A. M. Jacobi, A. Hansen, G. Muehlinghaus, C. Berek, F. Hiepe, R. Manz, A. Radbruch, T. Dorner. 2005. Generation of migratory antigen-specific plasma blasts and mobilization of resident plasma cells in a secondary immune response. Blood 105: 1614-1621. Lanzavecchia, A.. 1983. One out of five peripheral blood B lymphocytes is activated to high-rate Ig production by human alloreactive T cell clones. Eur. J. Immunol. 13: 820-824. Holder, M. J., S. D. Abbot, A. E. Milner, C. D. Gregory, M. Casamayor, G. D. Johnson, I. C. MacLennan, J. Gordon. 1993. IL-2 expands and maintains IgM plasmablasts from a CD5+ subset contained within the germinal centre cell-enriched (surface IgD-/CD39-buoyant) fraction of human tonsil. Int. Immunol. 5: 1059-1066. Manz, R. A., M. Lohning, G. Cassese, A. Thiel, A. Radbruch. 1998. Survival of long-lived plasma cells is independent of antigen. Int. Immunol. 10: 1703-1711. Newport, M. J., T. Goetghebuer, H. A. Weiss, H. Whittle, C. A. Siegrist, A. Marchant. 2004. Genetic regulation of immune responses to vaccines in early life. Genes Immun. 5: 122-129. Marchant, A., M. Pihlgren, T. Goetghebuer, H. A. Weiss, M. O. Ota, S. E. Schlegel-Hauter, H. Whittle, P. H. Lambert, M. J. Newport, C. A. Siegrist. 2006. Predominant influence of environmental determinants on the persistence and avidity maturation of antibody responses to vaccines in infants. J. Infect. Dis. 193: 1598-1605. Danilova, E., A. Shiryayev, V. Skogen, E. K. Kristoffersen, H. Sjursen. 2005. Short-term booster effect of diphtheria toxoid in initially long term protected individuals. Vaccine 23: 1446-1450. Danilova, E., A. Shiryayev, E. K. Kristoffersen, H. Sjursen. 2005. Attenuated immune response to tetanus toxoid in young healthy men protected against tetanus. Vaccine 23: 4980-4983. Richmond, P., R. Borrow, E. Miller, S. Clark, F. Sadler, A. Fox, N. Begg, R. Morris, K. Cartwright. 1999. Meningococcal serogroup C conjugate vaccine is immunogenic in infancy and primes for memory. J. Infect. Dis. 179: 1569-1572. Clutterbuck, E. A., P. Salt, S. Oh, A. Marchant, P. Beverley, A. J. Pollard. 2006. The kinetics and phenotype of the human B-cell response following immunization with a heptavalent pneumococcal-CRM conjugate vaccine. Immunology 119: 328-337. Tangye, S. G., D. T. Avery, E. K. Deenick, P. D. Hodgkin. 2003. Intrinsic differences in the proliferation of naive and memory human B cells as a mechanism for enhanced secondary immune responses. J. Immunol. 170: 686-694. Liu, Y. J., J. Zhang, P. J. Lane, E. Y. Chan, I. C. MacLennan. 1991. Sites of specific B cell activation in primary and secondary responses to T cell-dependent and T cell-independent antigens. Eur. J. Immunol. 21: 2951-2962. Kroese, F. G., H. G. Seijen, P. Nieuwenhuis. 1991. The initiation of germinal centre reactivity. Res. Immunol. 142: 249-252. Crotty, S., R. D. Aubert, J. Glidewell, R. Ahmed. 2004. Tracking human antigen-specific memory B cells: a sensitive and generalized ELISPOT system. J. Immunol. Methods 286: 111-122. Cassese, G., S. Arce, A. E. Hauser, K. Lehnert, B. Moewes, M. Mostarac, G. Muehlinghaus, M. Szyska, A. Radbruch, R. A. Manz. 2003. Plasma cell survival is mediated by synergistic effects of cytokines and adhesion-dependent signals. J. Immunol. 171: 1684-1690. Salmi, M., S. Jalkanen. 1997. How do lymphocytes know where to go: current concepts and enigmas of lymphocyte homing. Adv. Immunol. 64: 139-218. MacLennan, I. C.. 1994. Germinal centers. Annu. Rev. Immunol. 12: 117-139. Vitetta, E. S., M. T. Berton, C. Burger, M. Kepron, W. T. Lee, X. M. Yin. 1991. Memory B and T cells. Annu. Rev. Immunol. 9: 193-217.